I'm so excited to share this tutorial with you all, why? Because flowers crowns make everything better; from trips to the supermarket to dancing in a field, I promise you that every occasion is improved by wearing a crown of flowers. With the few glimpses of spring we have been having this week, this is the ideal tutorial to get practicing for the warm months ahead. I have used real flowers for my crown but use fake if you want yours to last until September. All the steps are below. Step 1. First cut a length of wire longer that the circumference of your head. 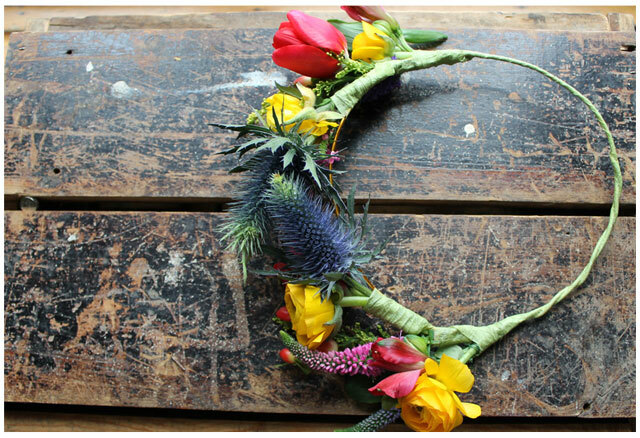 Make a circle shape so that it fits snugly around your head but allowing enough space to add your flowers. Step 2. 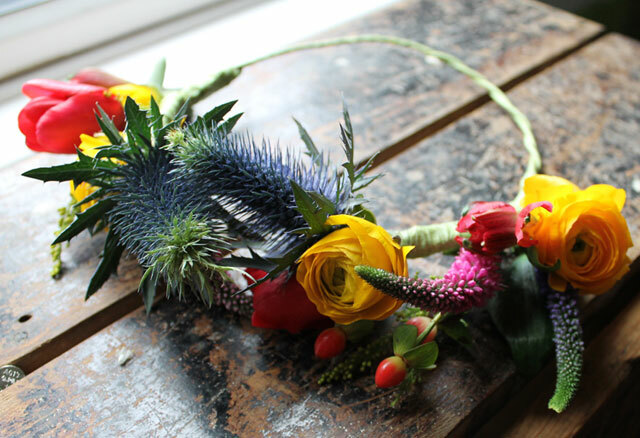 Select you flowers, use a mix of buds, leaves and sprigy flowers to give balance and depth to your crown. Step 3. Take three flowers at a time and gently wrap with the fine florists wire. Use your judgement, too lose and the flowers will come loose, too tight and you will snap the stems. Step 4. About 7cm from the head of the flowers cut your stems. Step 5. Taking another piece of wire fix your bunch of flowers onto the wire. If you are going to do a full crown with no wire showing then it makes no difference where you start but if you are going to have your wire on show then aim to cover up where you have twisted your wire together. For this design I made three bunches of flowers facing inwards on each side, if you are doing the same make sure you place your first bunch roughly in the centre. I didn't and it bugged me a little bit! Step 6. Take your florists tape and wrap the stems and wire so they are covered, stop wrapping about 1.5cm from the end of the bunch. Step 7. 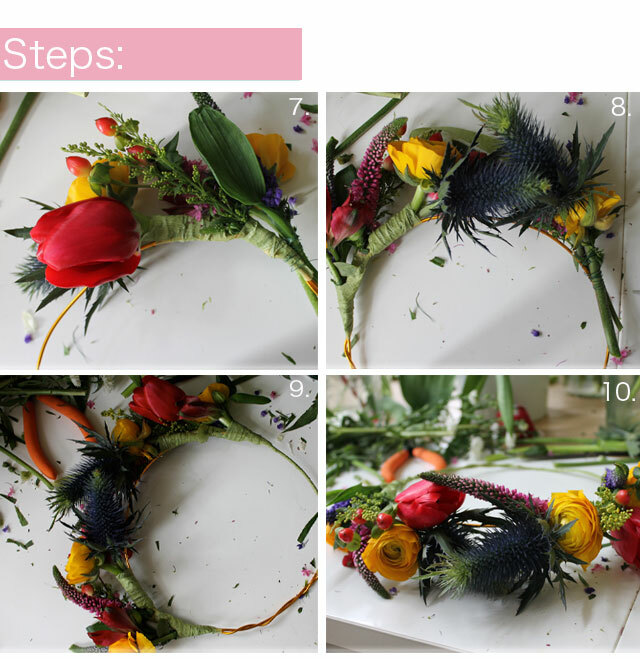 For adding the remaining flowers you are just repeating steps 3 - 6. Take a second bunch of flowers, ideally use a different mix to the first. Wrap, cut, fix and wrap with tape. Repeat with your third bunch. Step 8. If you are mirroring your design then simply repeat on the opposite side. If not keep going until you have reached the desired coverage. Step 9. 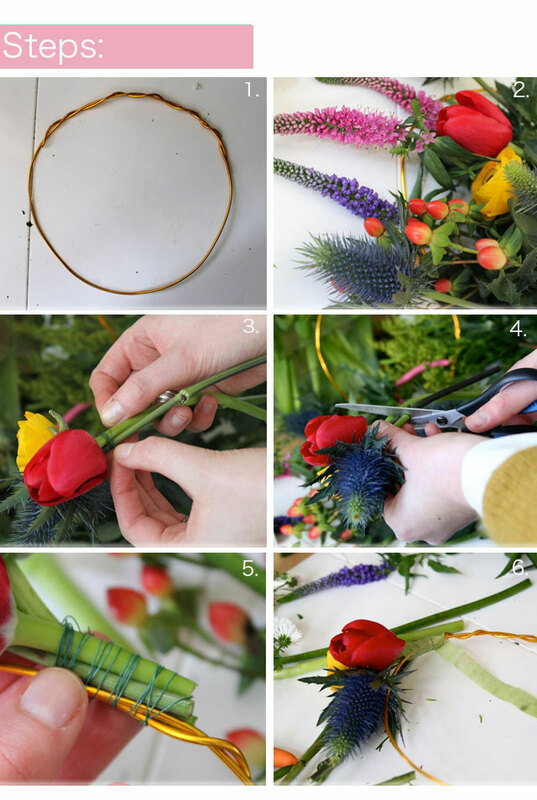 To finish wrap your florists tape around the whole of the band starting from the stems of your final bunch of flowers. If you fancy something more colourful you could easily wrap your band in some ribbon (use a 5mm width and double sided tape) or a gorgeous coloured masking tape, how good would neon look?! Thanks to Natalie and Katie for some of your photos and the action shots of my hands! Thanks Laura, so glad you like. This is so pretty. I love the colours and flowers you used. I think my little girl would look so cute in one of these.